On January 4th 2017, Norwegian technology company Airthings introduced its new smart radon gas detector - Airthings Wave - at the Consumer Electronics Show (CES) in Las Vegas - the world’s largest consumer electronics exhibition. To launch a product at such a prominent trade fair is a rare occurrence for a Norwegian tech company. Our product designers at EGGS are proud to have helped design and develop the product, digital elements, branding and visual profile for this simple, yet potentially life-prolonging solution. Radon is a radioactive gas found within rock and soil. In the USA alone, it's the second most frequent cause of lung cancer, resulting in 21,000 deaths per year. It can seep into your house, workplace or in schools through cracks and small openings, and build-up over time to excessive levels, contaminating the air. Consequently Radon is considered to be a major health hazard, affecting millions of people worldwide. Airthings Wave is yet another solution showing how innovation within technology - Internet of Things (IoT) - is making previously professional technology accessible to consumers. To detect and measure radon levels previously, you would have to set up specialist equipment and then go through a tedious process of gas detection, or call in experts to do the job for you. Getting a full evaluation could take weeks. Airthings Wave now allows you to conveniently measure radon levels yourself, using an easy-to-fix ceiling sensor that automatically syncs with an app on your mobile phone or tablet via Bluetooth. Provided with accurate data, you can clearly monitor any dangerous amounts of radon present and take subsequent action. Airthings Wave: a smart radon gas detector that syncs to an accompanying app and sends data via Bluetooth. 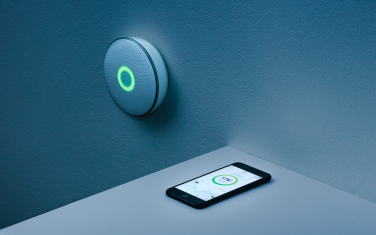 EGGS has been involved in the product design of the sensor and the digital design of the app - ensuring interaction design that combines aesthetics with optimal user experience. EGGS has helped Airthings develop a holistic experience by devising the whole concept of the sensor and the app, as well as the corporate rebranding of the company. This includes the visual profile, identity and logo - all of which form the basis of Airthings' updated website. With Airthings' mission to make radon gas detectors as common as smoke detectors, it looks as though we can all breathe a sigh of relief from now on! Throughout the product design process, prototyping with 3D printing enabled testing of distribution of all components and electronics - guaranteeing ease of engineering and manufacturing. 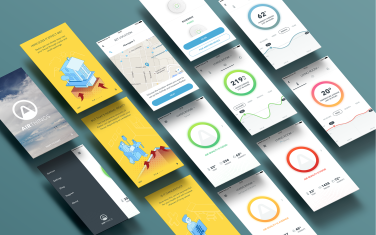 EGGS has helped Airthings develop a holistic experience by devising the whole concept of the sensor and the app, as well as the corporate rebranding of the company. 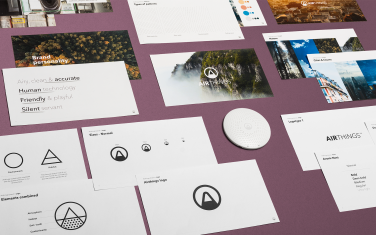 This includes the visual profile, identity and logo - all of which form the basis of Airthings' updated website.